If you're not using any of these on your blog, click through to the various Buzz posts and Help articles that explain them, and check them out — they're really nifty. And many thanks for sticking with Blogger through the transition to the new version earlier this year — it's a powerful and scalable platform on which we'll be building lots of exciting new features in 2008! We apologize for having broken these features for you. Your blogs and Help Group posts showed us the true extent to which you used and cared about these features, so please let us know if they're still being problematic. , OpenID commenting is now available for all Blogger blogs. This means that your friends and readers can leave authenticated comments on your blog using their blog URLs from OpenID-enabled services such as WordPress.com, LiveJournal, and AOL Journals, or with their AOL/AIM accounts. We've chosen a few popular OpenID providers to highlight on the comments form, but OpenID is, well, "open"! You can use any OpenID service to post a comment by choosing "Any OpenID" and filling in your OpenID URL. You'll see the OpenID icon ( ) next to the names of commenters who posted with their OpenID. This icon assures you that the person who posted the comment is the same person blogging at the URL their name links to. Say goodbye to comment spoofing! Blogger provides helpful shortcuts to WordPress.com, LiveJournal, TypeKey, and AOL, but you can use any URL that you control as your OpenID URL by using delegation. For example, say you have a LiveJournal account with the username "brad." This gives you an OpenID URL at http://www.livejournal.com/users/brad/. You could comment with this URL, but you'd rather have your comments link to your homepage at http://bradfitz.com/. By copying two lines of HTML into the <head> tag of http://bradfitz.com/, you can turn it into an OpenID URL. Then, you can use http://bradfitz.com/ to sign your comments, while logging in to LiveJournal when you do so. Delegation gives you complete control over what URL you use to represent yourself online, and complete control over what service you want to use to login with. Sam Ruby wrote a great article about OpenID delegation that we recommend if you're interested. LiveJournal, AOL, WordPress.com, and TypeKey aren't the only OpenID providers out there. If you need an OpenID account, you can also get one from myOpenID, Verisign, or any other service that implements OpenID. Right now, the only way to add a URL to your name when commenting is to sign your comment with OpenID. We apologize for removing the URL field from the comments form prematurely two weeks ago. That was a mistake on our part that came from launching OpenID support on Blogger in draft. Ironically, our testing of OpenID, a feature that lets you use accounts from all over the web to comment on Blogger, made it appear that we were trying to force you into getting a Google Account. We regret this appearance, since we're strong supporters of OpenID and open web standards in general. If you haven't set up OpenID, you can still link to your blog — or any webpage, for that matter — by using the standard <a> tag inside the comment form. 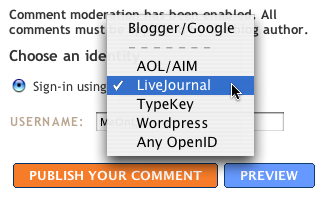 After just two short weeks of testing on Blogger in draft, OpenID commenting is now available for all Blogger blogs. This means that your friends and readers can leave authenticated comments on your blog using their blog URLs from OpenID-enabled services such as WordPress.com, LiveJournal, and AOL Journals, or with their AOL/AIM accounts.